Kapalua (Lahaina-Kaanapali) Airport (JHM) is a small, commercial airport serving inter-island travelers. For North Shore visitors, this is a handy option. 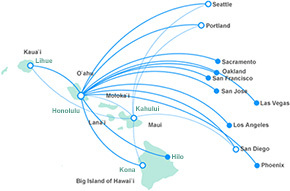 Rental vehicles are located at Kaanapali Service Center in Lahaina. The airport operates during daytime hours.